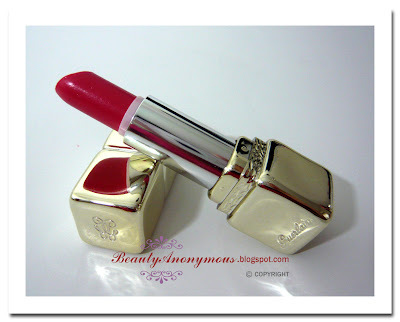 If you have been looking for a moisturizing lipstick, Guerlain lip products are a beautiful choice I'd recommend. 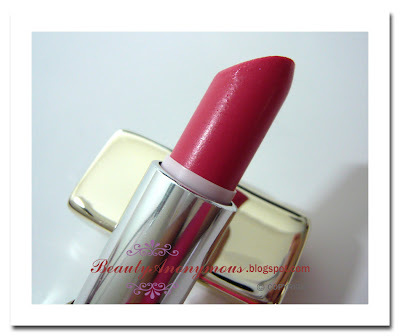 I posted a review on KissKiss Lipstick in the shade of Pretty in Pink a while back. 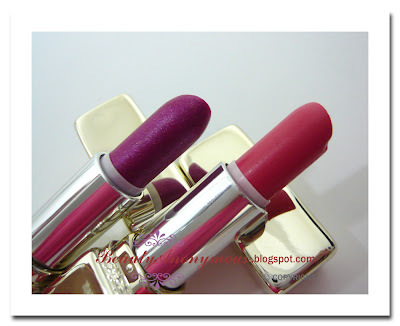 Today, I bring you a review on KissKiss Maxi Shine Sheer Colours Volume Effect, which is a sheer and shimmering version of Guerlain KissKiss Lipstick. 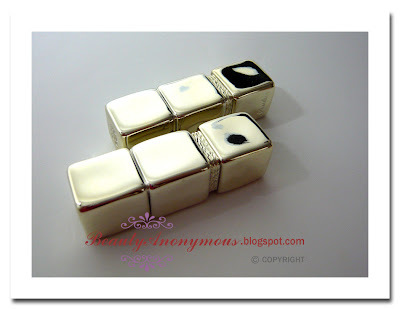 The lipsticks are housed in silverstone jewel cases created by French jewelery and furniture designer Hervé Van der Straeten. The shades of KissKiss Maxi Shine Sheer Colours Volume Effect liptsticks that I have are #667 Fuchsia Shine and #663 Strawberry Shine. Fuchsia Shine has been discontinued, while Strawberry Shine remains available. 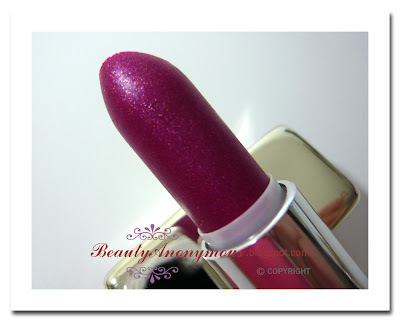 Fuchsia Shine is a violet pink with a blue undertone. Strawberry Shine is a light soft pink with a coral undertone. Both contain multi-colored shimmer. Fuchsia Shine features noticeable shimmering particles, and the shimmer of Strawberry Shine is more refined and subdued. 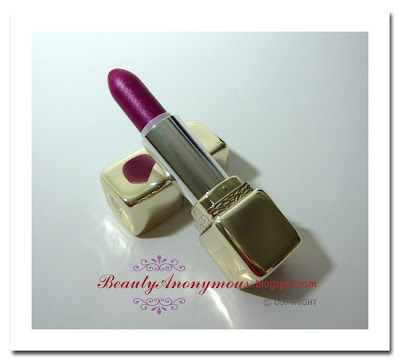 The KissKiss Maxi Shine lipstick is scented with violets and red fruits. While this fragrance might not be the cup of tea for everyone, I personally don't find the smell bothering. These lipsticks have an extraordinary satiny texture. It goes on so soft and smooth that it feels like a lip balm on my lips without a sticky feeling. I usually prime my lips with some lip balm before applying lipstick. The KissKiss Maxi Shine lipstick is so moisturizing that it doesn't dry out my lips throughout the day. Sometimes I even apply the lipstick without the help of lip balm. KissKiss Maxi Shine Sheer Colours Volume Effect has a smooth balmy consistency. 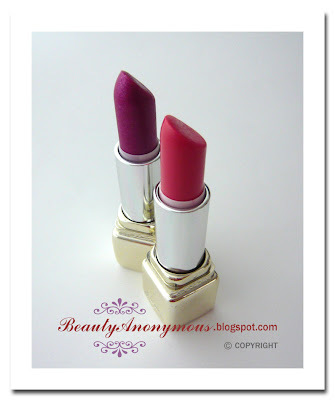 Compared to the KissKiss Lipstick series, it has a sheerer and more shimmering formula. It is layerable and buildable. A thin layer of application gives a transparent tint to my lips. 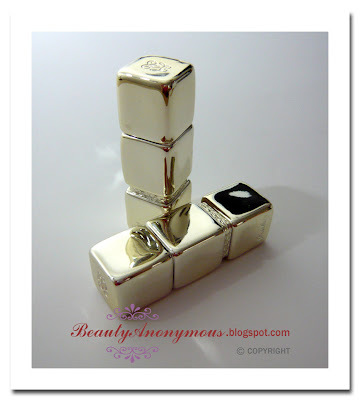 With at least three layers of lipstick, I found it delivers a luminous satin coverage with deeper pigment. What I love about it is it has the pigment of lipstick, but it delivers a nice wash of color like a lip gloss, and makes my lips look slightly fuller. Overall, Fuchsia Shine (violet pink with shimmer) is more to the purple side on my lips. It certainly has the intensity and drama for night occasions, but the multi-colored particles are too noticeably shimmery for my taste. Strawberry Shine (light soft pink with subdued shimmer) is a good everyday lipstick for me. The KissKiss Maxi Shine lipstick has a decent staying power. When the lipstick wears off, it leaves a natural-looking stain on my lips. 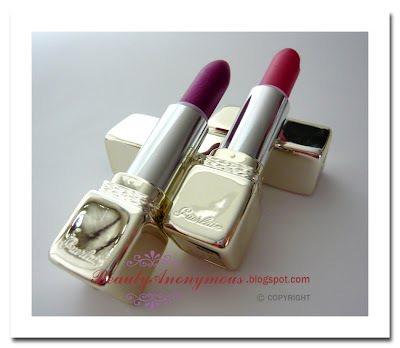 I am happy with these two lipsticks from Guerlain KissKiss Maxi Shine Sheer Colours Volume Effect. This lipstick range has the pigment of a lipstick, but it also features the sheer texture and shine of a lip gloss. Most of all, it provides long-lasting moisture to the lips. It leaves the lips feel smooth and moisturized. For people with dry lips or work long hours in air-conditioned offices, this is a good choice.